RIYADH/DUBAI/ADDIS ABABA (Reuters) – More than a million people from across the world – managers, maids, accountants and laborers – have left Saudi Arabia since March, after years or even decades working in the Gulf Arab state, which sustains its own citizens with oil revenues. 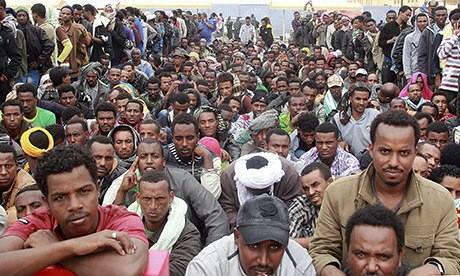 Around 120,000 Ethiopians have been deported in the past month alone as part of a visa crackdown aimed at pushing more Saudis into employment to ensure future political and economic stability. “We were kicked out of our homes and our jobs,” said Mohamed Ahmed, 27, waiting with thousands of other Ethiopians at a transit centre behind Addis Ababa’s Bole Airport after disembarking with a few bags from Saudi Arabian Airlines jets. Like many others, Ahmed, who spent five years in Saudi Arabia after crossing the Red Sea in a fishing boat and trekking through turbulent Yemen, had to leave at short notice. “We left all our belongings there,” he said. Saudi Arabia avoided significant unrest during the Arab Spring pro-democracy protest wave in 2011, but its leaders were uncomfortably aware that entrenched unemployment was a big factor behind rebellions in other Arab states. Cheap labor from 10 million foreigners in the country hampered previous government efforts to persuade the private sector to employ some of the 20 million locals. Many of those who have left were illegal immigrants like Ahmed, who crossed the kingdom’s porous borders or stayed on after the haj pilgrimage, which attracts around 2 million foreign visitors to Mecca every year. Many others came to Saudi Arabia legally then fell foul of rigid visa rules, which require all expatriates to work for a single employer in a field specified on their residence permit and are often used to exploit migrants. Mohammed Yunus, 27, was brought to Saudi Arabia by an employment agency to work at a hotel after taking loans to travel to the kingdom, but was soon told to leave his job. His sponsor then demanded 7,000 riyals a year ($1,867) to sign off on his visa papers while he found odd jobs on building sites and in grocery shops to pay his debts. Such tales of extortion are common among low-paid workers in the country. “I am trying to get back to Saudi. There’s no way I can repay my debts by working in India,” said Yunus, who worked in Saudi Arabia for five years before leaving during an amnesty declared in March to encourage expatriates to head home without paying fines for violating residency rules. The government said about 4 million people changed their visas to stay in the country, while another million left during the amnesty and can apply for new visas in future. When it ended in early November, forcible deportations began. Authorities raided shops, offices, marketplaces and streets in low-income areas, checking residence permits. The Labor Ministry has said it will set up new tribunals to hear expatriates’ complaints about their sponsors, but it has no plans to change the sponsorship system itself, something even a Saudi government-affiliated rights group recommends. International migration and rights groups have acknowledged Saudi Arabia’s right to deport visa violators and change its employment rules to favor locals, but are critical of the way the crackdown has been carried out. Deportees returning to Yemen and Ethiopia have reported ill treatment, including physical abuse and poor conditions at holding centers before they were expelled, the International Organization of Migration, an international agency, said. When millions rushed to rectify minor visa infringements earlier this summer, government departments appeared unprepared, causing vast numbers of people to queue in temperatures of 40 celsius, some for more than 24 hours. The government has dismissed allegations of abuse and chaotic policymaking as a foreign “smear campaign”, saying it welcomed expatriates who abide by the rules, and that 250,000 Saudis have gained jobs as a result of its crackdown. The human impact of making way for them has reverberated across the world. In Yemen, Ethiopia, Pakistan, Indonesia and India, politicians have voiced concern about the fate of their citizens in the kingdom. Egypt, Sri Lanka and the Philippines are all affected too. “I’m going back with literally nothing. All that I earned here has been spent on raising my children,” said Abdul Kareem Shamshudeen, 53, who returned to the Indian state of Kerala last week after illegally doing odd jobs in shops for 20 years. The impact has even been felt in other wealthy oil-exporting Gulf nations, which also have large expatriate populations and where many of those leaving Saudi Arabia now want to seek work – including Yunus, if he cannot go back. “I’m always hopeful there will be another chance,” he said. Although official unemployment among Saudis is around 12 percent, economists estimate up to two thirds are not in the labor force. Those who do work mostly have government jobs, the absolute monarchy’s way of spreading oil wealth and buying social peace, and tend to support large extended families. While the world’s top exporter now enjoys large surpluses, economists say a rising population and growing domestic energy consumption mean the burden of creating work must move to the private sector for the economy to continue to thrive. The cost for many migrant workers has been high. In the poor south Riyadh neighborhood of Manfouha, an Ethiopian man was killed in a confrontation with police during a visa raid. Days later, local anger spilled into clashes between Ethiopian migrants, riot police and some Saudis, leaving three dead. Ahmed, the returnee to Addis Ababa, said gangs of Saudis attacked Ethiopians and raped Ethiopian women. Saudis said Ethiopians had started the riot, rampaging through Manfouha with knives and sticks. “I gave myself up. I was afraid of getting killed,” he said. For the millions of expatriates remaining in Saudi Arabia, many of whom are still thought to be in breach of residency laws, the crackdown inspires gallows humor. A comic song called Ja Jawazat, “Passport department is coming”, has attracted a million views on YouTube. Faez Choudhary, a Pakistani national who wrote the song, was born and raised in Saudi Arabia and works at a Riyadh shopping mall. “I want to help other expatriates, especially those born here, understand this is our country as well,” he said.